For the first time ever, an outstanding book about Sven Brasch is out. "Master of the Poster - The Draughtsman Sven Brasch", is a riveting account of the life of the artist. It tells the story of an intriguing personality, the handsome dandy, the passionate admirer of women and elegance and family man. This story also depicts life in the small metro-polis of Copenhagen before and after World War II, and we are introduced to the people Sven Brasch crossed paths with during his long career as Scandinavias leading advertising artist. 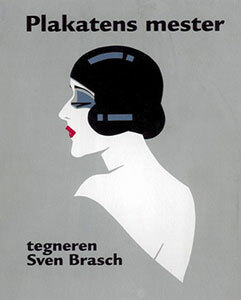 This book also displays the impressive body of work Sven Brasch produced during his lifelong career; posters, drawings, and a variety of commercial artwork. With more than 300 illustrations the book reads as a comprehensive guide to this great artists work.